Today I am participating in Mama Kat’s Writer’s Workshop by answering the prompt: 4.) 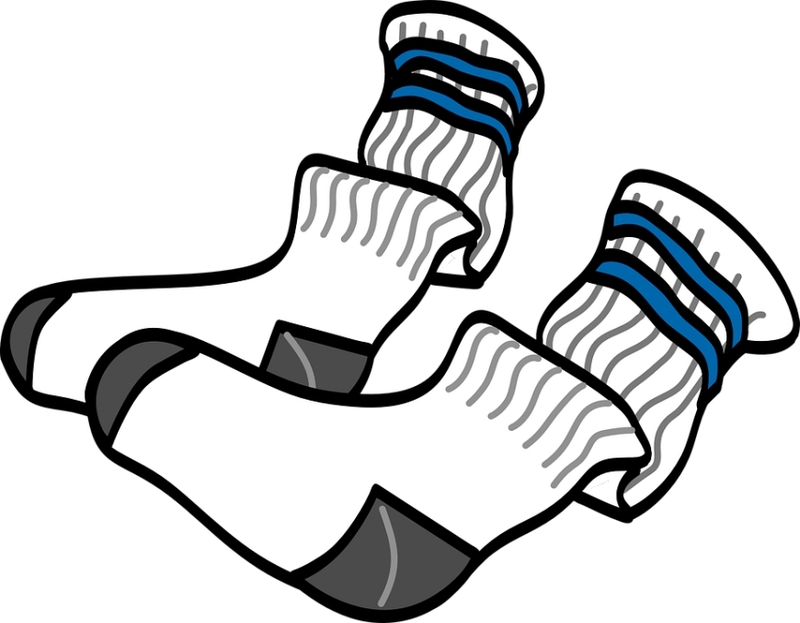 Write a funny story involving socks. My husband has a thing for socks. Really. He buys them in bulk and often. I don’t know what he does with all these socks, but I’ve given up trying to understand. When we go to Target and he throws yet another bag of socks in the cart, I say nothing. If I’ve learned anything in almost 17 years of marriage, I’ve learned to pick my battles. And socks aren’t worth arguing about. Except if they are holey–according to my husband, that is something to argue about. Holey socks are the bane of his existence. Normally oblivious to domestic affairs, the man goes ballistic if anyone in our house wears holey socks. At first I thought that he was kidding, but he is not. Not at all. Unfortunately my son does not share his father’s disdain for holey socks, so you can imagine the arguments that happen in our house. Or maybe you can’t, but let me tell you, it’s serious. My husband will rant about how no child of his is going to wear holey socks when he works hard for this family to provide shelter, food, a private school education – and blemish-free socks. I try to maintain a peaceful household by keeping my son in new socks, but he does his own laundry and I don’t always see when the socks are wearing thin. And honestly my son just doesn’t care; he will just as soon wear holey socks as in-tact ones. As I was packing for our trip to LA, I made sure all the socks were worthy. It was the least that I could do for the man who was going to be working so hard in LA. But I didn’t check the traveling socks. As we removed our shoes at airport security, and my son walked through the metal detector, I saw that he had on the holiest socks ever. With big gaping holes. So big that there was actually more naked foot visible than sock. My husband saw it too and his face said what he couldn’t in the presence of security guards: surprise, horror, disgust. His worst fear about socks had been realized. His kid was wearing holey socks for the whole world to see! “What?” asked my son, with a characteristic teenage shrug. He followed his father’s glare down to his feet. We boys have a tendency for holey socks! I remember when I had to expose my holey socks in public when I was studying. Quite embarrassing. funny how people have their little things that they fixate on, and others are completely oblivious to those same things. It’s the opposite in my household. Tshirts,socks and undies is what my son and hubby likes to wear! They have new packages of 3 but refuse to wear the new ones. I don’t get it! They say they are comfy, go figure! Perhaps you need to give him a darning ball and have him mend them. Perhaps that will stop him from wearing ones with holes. LOL My husband just continues to wear the socks with holes! New follower! That’s so funny! I can just picture the look on your husband’s face! I am intrigued by your blog and I will be back!!! I am a pseudo hippie myself! I was so excited that HAIR was brought back to Broadway! I never thought you guys were normal. 😉 Great story. Atl misses you! LOL…that’s because you know us in real life!